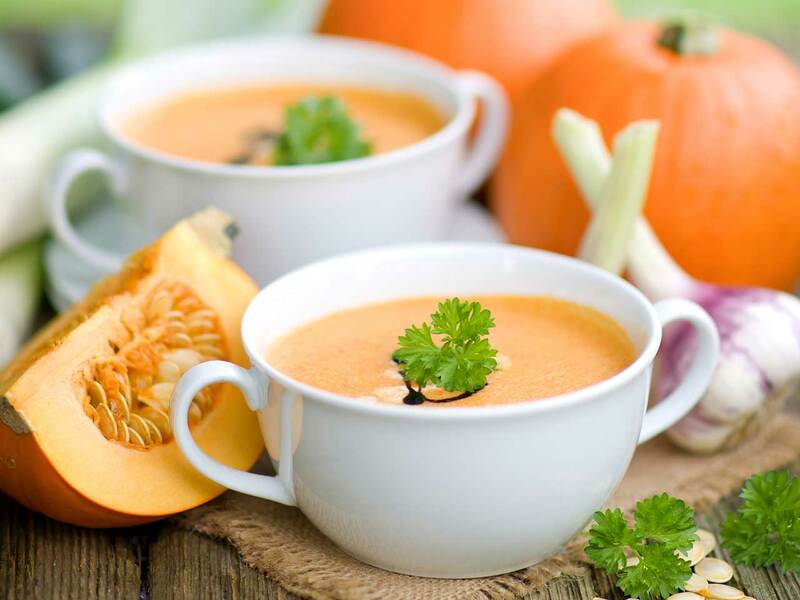 Don’t waste any of the pumpkin brains scooped out of your jack-o'-lanterns this Halloween, try this warming spicy pumpkin soup instead. Place the peppers skin side up, on a baking sheet and roast in the preheated oven for 20-25 minutes, until the skins are charred. Remove from the oven and place in a bowl. Cover with cling film and leave to cool. Once cool, peel off the skins, and reserve the flesh. Meanwhile, melt the butter with oil in a large, heavy based saucepan. Add the shallots, pumpkin and red chilli, season with sea salt and black pepper and sweat the vegetables for 5-10 minutes without browning. Add the garlic and thyme and cook on a low heat for a further minute. Pour in the vegetable stock, bring to the boil and simmer gently for 15 minutes. Add in the red peppers and cook for a further 5 minutes. Melt the butter in a small pan over a medium heat, add the cumin seeds and shallots and fry until soft. Add the ground cumin and paprika and cook the shallots for a further then 1 minute, stirring the shallot mixture all the time to prevent burning. Fry until caramelised for approx. 1-2 minutes. Remove from the heat and season with sea salt and stir in the honey. Blend the soup in a food processor or with a hand blender and adjust the seasoning to taste. Return to the pan, if a little thick add more stock and if you wish, stir in the cream. Gently reheat the soup and ladle into warmed bowls. Place a spoonful of low fat crème fraiche in each and sprinkle with the chives, toasted pumpkin seeds and candied shallots.